Looking south along the main walkway. The aquatic centre is to the left. Peeking through the trees at the lawn. We didn't see many kids parked on the playground —they were too busy testing the equipment. The plots for the community gardens. Banners for participating musicians. No beer was seen on the premises. Making music on the lawn. Bramwell Tovey conducting the Toronto Symphony Orchestra. The Optimists Alumni Drum & Bugle Corps prepare to start marching around the park. One of the dancers who roamed the grounds. One of the dancers honouring the First Nations historical presence in the city. Some of opening day's youngest entertainers. The first day of summer seemed an appropriate day to open the city’s newest major park. 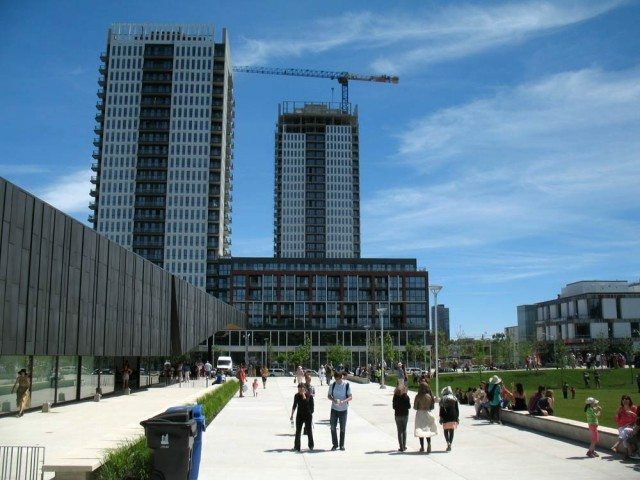 Sunny skies, comfortable temperatures, and curiosity drew hundreds of people to Regent Park Saturday afternoon to welcome the latest sign of the neighbourhood’s revitalization. “This is the people’s park,” declared councillor Pam McConnell (Ward 28, Toronto Centre–Rosedale) during the opening ceremony, referring to the input local residents offered during design consultations for the six-acre, $6.2-million grounds known simply as Regent Park. Bounded by Dundas, Oak, Sackville, and Sumach streets, the park adjoins the Regent Park Aquatic Centre opened in fall 2012. The site was given to the Parks, Forestry, and Recreation department by Toronto Community Housing. The big hit of day one was the playground, on the north side, where kids eagerly tried out the new equipment. On the park’s west side, dog owners tested the enclosed off-leash area. Speakers and dancers made use of the paved plaza, while the Toronto Symphony Orchestra played next to the aquatic centre. Performance artists, marching bands, and still more dancers paraded around the perimeter of the grassy “Great Lawn” at the park’s core, a space ideal for taking an afternoon siesta, collecting one’s thoughts, or contemplating the neighbourhood’s evolution. The park’s food amenities aren’t ready for prime time yet. The community gardens await planting, the bake oven sits behind fencing, and the greenhouse is still under construction. These elements will roll out over the next few months, as part of an effort by the Regent Park Food Partnership to bring residents together through participation in all aspects of food production and preparation. There are also plans for a farmers’ market. Based on its debut, Regent Park shows promise as a street-level community gathering space. As towers rise around it, the large open space of the park will serve a vital function as a place to relax, meet neighbours, and join in cultural activities.